He is known for his Mitterrand doctrine, a policy of not extraditing convicted far-left terrorists of the years of lead such as Cesare Battisti to Italy, due to the alleged non-conformity of Italian legislation to European standards of rule of law, in particular the anti-terrorism laws passed by Italy in the 1970s and 1980s. When the European Court of Human Rights finally ruled against the Mitterrand doctrine, the policy had already led to most of the criminals never being punished for their crimes. Mitterrand worked from January to April 1942 for the Légion française des combattants et des volontaires de la révolution nationale [fr] (Legion of French combatants and volunteers of the national revolution) as a civil servant on a temporary contract. He worked under Jean-Paul Favre De Thierrens who was a spy for the British secret service. He then moved to the Commissariat au reclassement des prisonniers de guerre (Service for the orientation of POWS). During this period, Mitterrand was aware of Thierrens's activities and may have helped in his disinformation campaign. At the same time, he published an article detailing his time as a POW in the magazine France, revue de l'État nouveau (the magazine was published as propaganda by the Vichy Regime). From spring 1942, he met other escaped POWs Jean Roussel [fr], Max Varenne, and Dr. Guy Fric [fr], under whose influence he became involved with the resistance. In April, Mitterrand and Fric caused a major disturbance in a public meeting held by the collaborator Georges Claude. From mid-1942, he sent false papers to POWs in Germany (ref unknown) and on 12 June and 15 August 1942, he joined meetings at the Château de Montmaur which formed the base of his future network for the resistance. From September, he made contact with France libre, but clashed with Michel Cailliau [fr], General Charles de Gaulle's nephew (and de Gaulle's candidate to head-up all POW-related resistance organizations). On 15 October 1942, Mitterrand and Marcel Barrois (a member of the resistance deported in 1944) met Marshal Philippe Pétain along with other members of the Comité d'entraide aux prisonniers rapatriés de l'Allier (Help group for repatriated POWs in the department of Allier). By the end of 1942, Mitterrand met Pierre Guillain de Bénouville, an old friend from his days with La Cagoule. Bénouville was a member of the resistance groups Combat and Noyautage des administrations publiques (NAP). In late 1942, the non-occupied zone was invaded by the Germans. Mitterrand left the Commissariat in January 1943, when his boss Maurice Pinot [fr], another vichysto-résistant, was replaced by the collaborator André Masson, but he remained in charge of the centres d'entraides. In the spring of 1943, along with Gabriel Jeantet, a member of Marshal Pétain's cabinet, and Simon Arbellot (both former members of La Cagoule), Mitterrand received the Order of the Francisque (the honorific distinction of the Vichy Regime). Mitterrand built up a resistance network (ref unknown), composed mainly of former POWs. The POWs National Rally (Rassemblement national des prisonniers de guerre [fr] or RNPG) was affiliated with General Henri Giraud, a former POW who had escaped from a German prison and made his way across Germany back to the Allied forces. In 1943 Giraud was contesting with de Gaulle for the leadership of the French Resistance. From the beginning of 1943, Mitterrand had contacts with a powerful resistance group called the Organisation de résistance de l'armée (ORA), organised by former French military personnel. From this time on, Mitterrand could act as a member of the ORA, moreover he set up his own RNPG network with Pinot in February and he obtained funding for his own network. 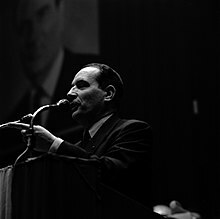 In March, Mitterrand met Henri Frenay, who encouraged the resistance in France to support Mitterrand over Michel Cailliau. 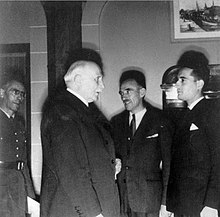 28 May 1943, when Mitterrand met with Gaullist Philippe Dechartre [fr], is generally taken as the date Mitterrand split with Vichy. According to Dechartre, the meeting on 28 May 1943 was set up because "there were three movements [of Résistance:] […] the Gaullist, the communist, and one from support centers […] hence I was assigned the mission to prepare what would be called afterwards the merger [of the three movements]." Mitterrand returned to France by boat via England. In Paris, the three Resistance groups made up of POWs (Communists, Gaullists, RNPG) finally merged as the POWs and Deportees National Movement (Mouvement national des prisonniers de guerre et déportés [fr] or MNPGD) and Mitterrand took the lead. In his memoirs, he says that he had started this organisation while he was still officially working for the Vichy Regime. From 27 November 1943 Mitterrand worked for the Bureau central de renseignements et d'action. In December 1943 Mitterrand ordered the execution of Henri Marlin (who was about to order attacks on the "Maquis") by Jacques Paris and Jean Munier, who later hid out with Mitterrand's father. 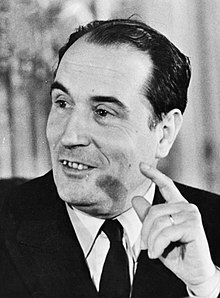 Also in that same year, on the Avenue de l'Observatoire in Paris, Mitterrand claimed to have escaped an assassin's bullet by diving behind a hedge, in what became known as the Observatory Affair. The incident brought him a great deal of publicity, initially boosting his political ambitions. Some of his critics claimed, however, that he had staged the incident himself, resulting in a backlash against Mitterrand. He later said he had earlier been warned by right-wing deputy Robert Pesquet that he was the target of an Algérie française death squad and accused Prime Minister Michel Debré of being its instigator. Before his death, Pesquet claimed that Mitterrand had set up a fake attempt on his life. Prosecution was initiated against Mitterrand but was later dropped. Nonetheless, the Observatory Affair cast a lasting shadow over Mitterrand's reputation. Years later in 1965, when Mitterrand emerged as the challenger to de Gaulle in the second round of the presidential elections, de Gaulle was urged by an aide to use the Observatory Affair to discredit his opponent. "No, and don't insist" was the General's response, "It would be wrong to demean the office of the Presidency, since one day he [Mitterrand] may have the job." ^ a b Simons, Marlise (17 July 1995). "Chirac Affirms France's Guilt in Fate of Jews". The New York Times. ^ "France opens WW2 Vichy regime files". BBC News. 28 December 2015. ^ "Israel PM mourns France's deported Jews". BBC News. 16 July 2017. ^ "'France organised this': Macron denounces state role in Holocaust atrocity". The Guardian. Associated Press. 17 July 2017. ^ "Les guillotinés de Mitterrand – Le Point". lepoint.fr. 31 August 2001. Retrieved 7 December 2014. ^ Dalrmymple, Theodore (March 2015). "The Battle of Algiers". The New English Review. Retrieved 25 October 2016. ^ "Congrès d'Epinay (1971)". Dailymotion. 22 March 2008. Retrieved 22 March 2017. Celui qui n’accepte pas la rupture avec l’ordre établi, avec la société capitaliste, celui là, il ne peut pas être adhèrent du Parti Socialiste. ^ Birch, Jonah (19 August 2015). "The Many Lives of François Mitterrand". Jacobin. Retrieved 22 March 2017. ^ Corbett, Anne; Moon, Bob (11 March 2002). Education in France: Continuity and Change in the Mitterrand Years 1981–1995. Taylor & Francis. pp. 96–. ISBN 978-0-203-03568-9. Retrieved 28 August 2014. ^ New Scientist. Reed Business Information. 21 April 1988. p. 29. ISSN 0262-4079. Retrieved 7 December 2014. ^ "Allocution de M. François Mitterrand, Président de la République, aux cérémonies du tricentenaire de la Révocation de l'Edit de Nantes, sur la tolérance en matière politique et religieuse et l'histoire du protestantisme en France, Paris, Palais de l'UNESCO". Discours.vie-publique.fr. 11 October 1985. Retrieved 11 March 2013. ^ "Royal Decree 14921/1982" (PDF). Spanish Official Journal. 10 July 1982. Retrieved 20 September 2017. This page was last edited on 6 April 2019, at 04:03 (UTC).